Ah, 2016 – the electoral year that keeps on giving. From the UK EU membership referendum, a narrow miss for the Pirate Party in Iceland’s parliament, an Austrian presidential election postponed thanks to faulty glue, and over 100 other elections and referenda worldwide. And lest we forget, the ongoing US presidential election, now just five days away. The race for the White House is currently disputed between the Democrat candidate Hillary Clinton and Republican candidate Donald Trump, with polls showing a tightening race in the final stretch. While the US is trapped in feverish speculation and much hand wringing at the latest poll results, the rest of the world watches silently as the next Western hegemon is chosen. But perhaps not so silently, as a few news outlets have taken to asking citizens outside the US about their opinion on the current electoral process. Given the significant international repercussions any electoral result will have, it poses an interesting question – if you are a citizen of the world, which candidate would you vote for? Now, many of these are not scientific polls, but what polls analyst Nate Silver of FiveThirtyEight has taken to calling “clickers”, in that you put a straw poll on the internet and have visitors click on their preferred candidate. It should be immediately obvious that there are flaws with this approach, including a self-selection bias for respondents, no accounting for demographically balanced sampling and the opportunity for abuse by users casting votes multiple times. At best, “clickers” represent a minority of internet-using, English-speaking people who happened to come across your straw poll. And worst, they are fundamentally flawed exercises that tell us nothing useful. And the results are quite fascinating. One popular interpretation of the unscientific “clicker” polls is that the world leans Democrat, while Russia is the lonesome supporter of the Republican candidate. Does this bear out in scientific polling? The short answer is yes: every other country surveyed gives Clinton an advantage except Russia, where 33% of respondents would vote for Trump compared to 10% who would support Hillary. What these stories ignore, however, is the clear majority of Russians surveyed did not side one way or the other, with 57% declaring “Don’t know/no response”. So the majority of Russians surveyed would not vote for Donald Trump, but instead have no defined opinion or declined to comment. The second narrative that has emerged from worldwide polls is the overwhelming support for the Democrat candidate across the globe. Indeed, the average across the 45 nations surveyed gives Clinton a +50% lead, while current estimates give her a measly +3.1% lead in the US popular vote. It might shock some readers that there is such discrepancy between popular opinion in the US and the rest of the world, but this discrepancy is far from homogenous. Surprisingly, the country most similar in popular opinion to the US right now is China. With 53% favouring Clinton and 44% favouring Trump, that gives Clinton a 9% lead, still larger than the actual lead in US polls. China also has the lowest number of undecided respondents (3%) of the 45 countries surveyed at, even lower than the US electorate currently at 5%. Let us reflect on the fact that people literally on the other side of the world are more likely have made up their minds about these two candidates, than the citizens actually having to vote less than a week from now. We can take this further and inspect polling not country by country, but state by state. One of the advantages of the unrelenting scrutiny of the electorate we see in US presidential elections, is that we get continuous polling from each individual state on a near-daily basis. For this step, we will take the weighted polling average for each state as provided by FiveThirtyEight and compare them with the individual polling results for non-US countries (Technical note: polling adjusted for recency, likely voter ratio, omitted third parties, and pollster house effects. Full methodology here). The countries that are most similar in presidential candidate leaning to US states are far and away Russia (Trump +23%) and China (Clinton +9%). These two alone account for the majority states, 44 out of 50 (plus DC). This translates fairly well to the individual state polls – a strong preference for Trump in the Midwest and South, and lukewarm but widespread support for Clinton elsewhere. 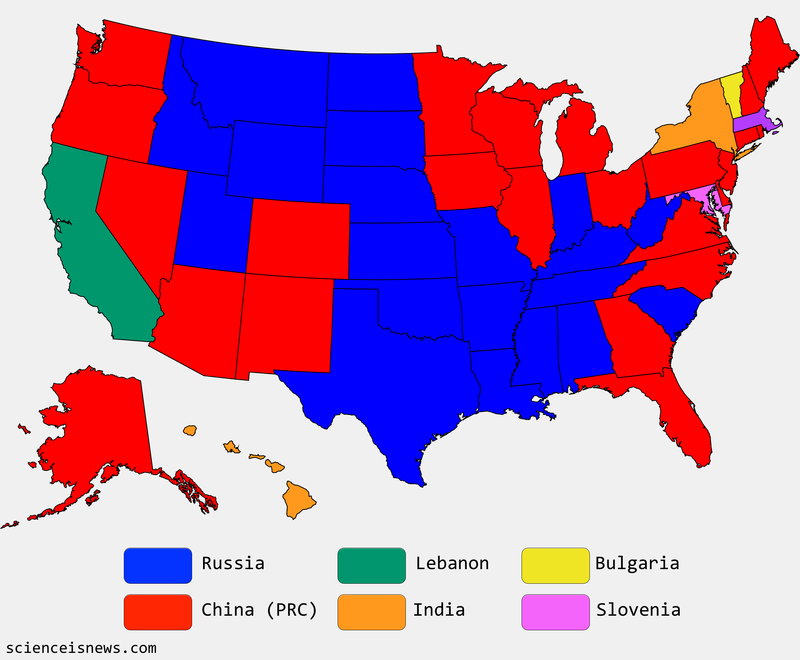 A handful of other states are most similar to four other countries (Lebanon, India, Bulgaria and Slovenia), all Democrat-leaning. What does this exercise tell us? First, it shows how US political races divide opinion worldwide. 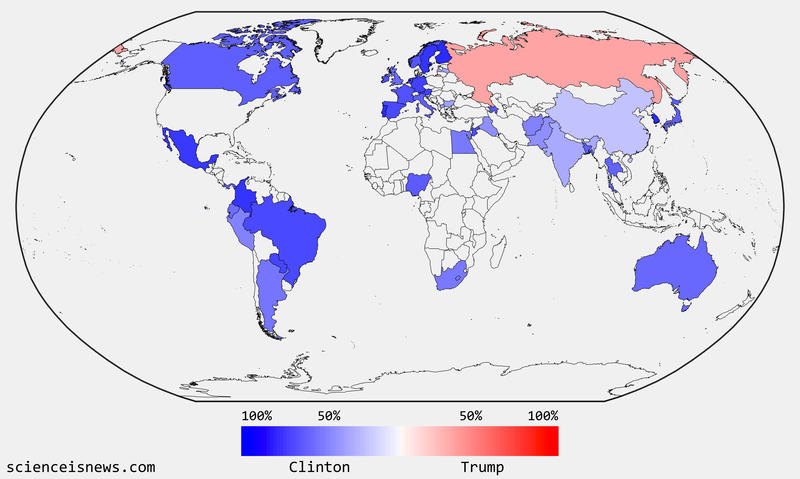 While most of the 45 countries surveyed were Democrat-leaning, there is significant heterogeneity in the level of endorsement for Hillary Clinton, with strongest support in Western Europe and Latin America and weaker support in Africa and Asia (albeit from a limited sample of countries). Second, the story of “Russia supports Donald Trump” does not check out. A larger group of respondents in Russia expressed no opinion about the election than supporters of Clinton or Trump combined. Finally, state-wise analysis shows that worldwide opinion are not good models of regional US political leanings, with the extreme countries in the survey (Russia: strong Republican, China: lukewarm Democrat) being most similar to individual state polls. If you are in the US, perhaps time to consider a vacation in a political soul mate across the globe? Survey of opinions on US election in 45 countries carried out by WIN/Gallup International and released here. US national and state poll averages from FiveThirtyEight aggregates. Number of undecided voters aggregated by the Huffington Post. All polling indices current as of 3rd November 2016.